I don’t think trench coats come much more “modern classic” than this. If I had to ask a someone to design one for me, I hope this Laura Ashley trench is what they’d come up with… is there anything more satisfying than a wardrobe must-have that’s just perfection? As well as being a perfect fit, the length is spot-on and I love the asymmetrical buttoning and flap detail. Iconic British label Laura Ashley is not a brand I’d normally associate with wardrobe essentials – but they have excelled themselves with this beauty. So a truly classic item of clothing needs classic styling, right? Er, no – not this time, at least. To counteract both the Britishness of the brand and the classic design of the coat, I decided to go edgy with some mixed animal prints (jeans, top and bag), fierce jewellery and heels. And what I also love about the coat is that it looks as good done up as it does open so you can show your outfit underneath. My photos should be up on the Laura Ashley blog very soon – I’ll update a link as soon as they’re on there. A few other bloggers are styling the same trench so I’ll be interested to see how they’ve styled it. I can’t wait to wear it more as the weather gets chillier (I’ll probably regret saying that)…! Have you found yourself the perfect wardrobe essential? I’m thinking trench coats, crisp white shirts, little black dresses – or are you still looking? Let me know! Laura Ashley kindly gifted me this trench coat and bag. All opinions are my own, however, and 100% honest. Previous Post Sponsor Not Dressed As Lamb in September – It’s Easy Peasy! So happy to have found this blog. Very inspiring! Thank you. Oh wow, you're right, that is an amazing trench! I love trench coat and I like the way you mix & matched it. I can only wish I can wear a trench coat so very often here. Perfect trench, you are so right. And if there is anybody who can customize such an item, it is you. Love the look. Nice bag too by the way. My favourite wardrobe piece at the moment is my pair of black skinny trousers. The broach is the perfect touch! Love my trench coat…I just bought one for my 9 year old daughter, can't wait til she gets the chance to rock it! I love everything about this outfit. Who would have thought leopard leggings could ever look so great? That trench is perfect! Not too long, not too short. It fits you beautifully. My essentials are blazers – There are a couple that I keep reaching for time and time again. And a good bag always saves the day for me. Love the trench. For me a plain t-shirt would have worked better – just a smidge too much animals but that's just me – did you change the buttons on the trench or was that how it came ? Good work ! Love love love the brooch! I'm all about the trenches too. I have a few from London Fog, with removable warm lining. In my rainy climate (on the south-west coast of Canada), they can get me through most of the winter. In the rest of Canada? They'd get someone through to late September and wouldn't be worn again until maybe late April or early May. That's one great coat and the fit is beautiful on you! I like how you styled it with the bright pant. 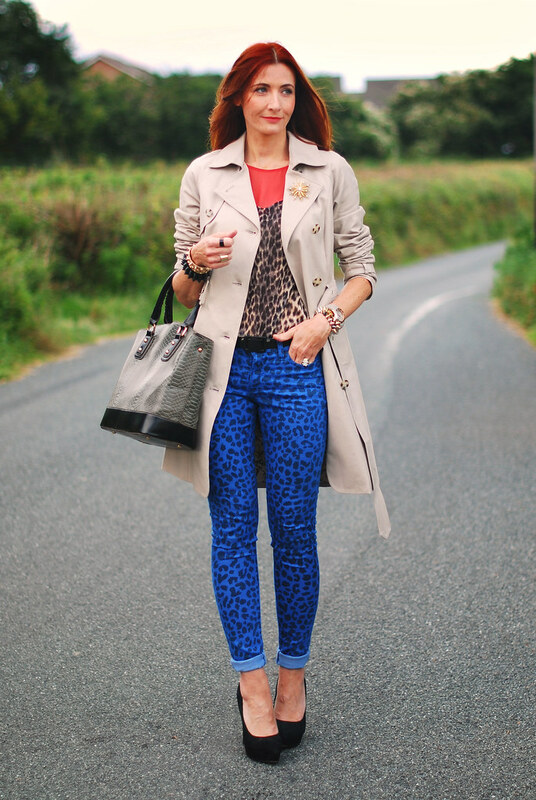 That trench is very classic – Love that you kick it up a notch with the multiple animal print! This is indeed a very flattering cut and fits you very well! Nice how you styled it with skinnies and high heels! 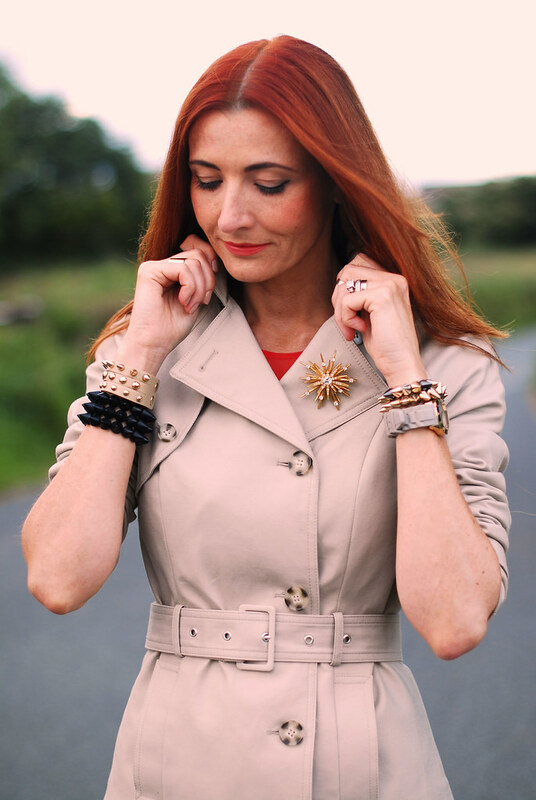 The trench looks fabulous on you, and love the brooch too. Can't go wrong with leopard print either. I love the asymmetric, single breasted design of the trench. I'd have to say that slim dark (black or navy) pants have become my indispensable wardrobe item. I love the cut of that trench! I have a classic London Fog that i found in pristine shape at a thrift store, and I can't wait to wear it again this fall. I love the way you have mixed your leopard. I would have never thought two shades of it could look so fabulous together!